It also marks the beginning of many firsts. I attended my first back-to-school night at my daughter's school and met her first grade teachers. I've watched her first three soccer practices and am readying myself for the first 6pm game on Friday evening. So far, no rain - just seasonably cool. Does that mean ski pants or just jeans for me? Definitely socks, probably not yet a hat. Time, then, for The Carpetology Blog Roundup for September, 2008! First, I'm most proud that Carpet and The Carpetology Blog Are On a Roll! Why? Because carpet and the stylishness of carpet are in vogue. Have you noticed? The Baltimore Sun certainly has. I'm not too surprised as I've been having a field day getting up-close-and-personal with more fashionable carpet styles than I ever expected to! Consider a 'Tailored Frieze' Carpet Style. For that matter, check out A Foot's Perspective - Episode 12. I love what my Mom created with two different carpet styles. What's particularly exciting is that consumers are rediscovering the brilliantly stylish output of the many creative and talented people who contribute to the flooring industry. It's definitely time to banish the boring sea of carpet sameness! Consider this example of intense creative inspiration: Nature Inspires Invision's Altered Elements Carpet Collection. Or, what about the sources of trend concepts that go into colors and carpet style trends - as Ann Hurley describes in A Foot's Perspective - Episode 13 about Maison & Objet. Those types of observations are what led to Black Around The World which is one part of Color Folio 2008: A Field Guide to Color Around The World. In addition to celebrating the stylishness of carpet, I decided to feature the FCIF and draw attention to what The Floor Covering Industry Foundation does. Fall can mean allergies, which may lead to lots of advice -- some good, some not-so-good. Carpet advice relating to allergies often falls in the not-so-good category which Paul Friederichsen addresses in Beware of Autumn Allergens… Advice for Carpet. As you walk through your children's schools, do appreciate the good that carpet offers when Carpet Goes Back to School. I noticed carpet in two sections of my daughter's classroom: one in the reading nook and another in a collaborative work area. In both cases, the carpet defined the space, added to the intimacy of the space and improved the acoustics. There's humor - Bud Light Does Carpet - and I hope you are following the Red Carpet Reporter Contest results. If not, then Meet Red Carpet Reporter Franchesca Ramsey. Mary Lou Quinlan - Founder/CEO Just Ask a Woman was a panelist from the Marketing to Women... Online seminar earlier this summer. Hearing her then reminded of previous times when I have enjoyed her insights. Not at the inaugural M2W conference, but shortly thereafter at a 2005 ANA event in NYC [note membership requ'd to access archives], then at a Columbia Women in Business event and another ANA event all about marketing to [and with] women I saw Mary Lou in action, sharing case studies and perspectives. I'll try to track those notes down to share them here. At all of these events, I've been taken with how insightful and grounding her perspective is. In the introduction to her 2003 book Just Ask a Woman: Cracking the Code of What Women Want and How They Buy, Quinlan says "I believe in marketing with women, treating them as business partners and listening to them throughout every step of the marketing process. The greatest marketers are not the best sellers or talkers. They are the best listeners." Points she made at the Marketing to Women... Online seminar. + Stress represents the number one issue that influences all other issues. + Women make decisions deliberately - taking their time and after doing a great deal of research. + Women are vigilante shoppers. Says Quinlan: "Vigilante captures the attitude of today's female shopper, who is tired of waiting for retailers to respect her needs. She sometimes feels angry and ignored, so now she is taking customer service into her own hands. She is on a mission to get satisfaction, and you are in her sights." + The complex way in which women view themselves affects how marketers connect with women. In other words, how well does your brand match up with her image of herself? + Technology enables. It can save time, simplify and diminish stress. It can also frustrate if it is too hard to use, not-user friendly, and doesn't let her be in charge of the experience. + She demands respect, for herself, her decisions, her intelligence, her research, and her causes. + She craves comfort and needs it defined on her terms, as it relates to her life. 2. Your service should be democratic even if the merchandise is not. 3. Beware of the so-called bonding behavior of your staff. 4. When she is ready to check out, she is already checked out -- hurry! 5. She will come back to stores that like her and are like her. + HT: She's super-stressed, time-pressured and has no time to waste. + WT: She makes time for what she wants to do and the Internet is a high priority. + HT: She's totally convinced that the Internet is a life-saver. + WT: She's in a tug of war between loving what it's done for her... and feeling guilty for her obsession. + HT: She feels like she has the longest to-do list, so online research is just one more job. + WT: She secretly gets ego rewards out of being counted on for answers and the Internet becomes her ally. + HT: In her 'real life,' she listens and consults with her "Board of Directors," close family and friends. + WT: She is just as likely to trust virtual strangers. + HT: Technology has allowed her to minimize undesired contact in her busy life, even with overly chatty family members. + WT: She is still hungry for personal connections that are attuned to her needs. + HT: She loves the independence of searching her way, no matter how much sifting and time it might take. + WT: She could really use someone to filter, edit and vet so that she could learn more, faster. What I take away from this is how important it is to truly listen to your customers - particularly women customers. The value you offer the marketplace holds meaning only if it valued by your primary customers. So ask them what's important Listen carefully to the answers so you can figure out how what you do offers value to women. Then, deliver that value and continue to listen so you stay grounded and readily determine how best to maintain that consistently high level of value over time. It may seem like an awful lot of work, but, when you remember how women make or influence over 85% of the purchasing decisions, it's worth it. Brands 2 originally uploaded by mleak. I've been thinking about brands and what they stand for. Especially given the tumultuous times. What do specific brands embody for customers? Are they strong and venerable? Trustworthy? Approachable? Dependable? Consider high-and-mighty brands like Lehman Brothers, Bear Stearns and AIG that have taken a tumble. Did they take seriously their promise to customers? What about other brands? 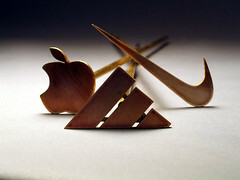 Brands like Apple, Nike, even Starbucks. How closely does their reality match up with my expectations for those brands? How much can I trust what they stand for? What about your brand? What does your brand stand for? What does it promise customers? Can you look customers in the eye and tell them that you stand for their best interests? That they can count on you to meet your promise? A promise that holds true regardless of the economic climate. "Even when there isn't an economic downturn, retailers should stay true to their fundamental brand values and create meaningful and differentiated points of view," state Bertrand Pellegrin and Ted Jacobs in an article in the DDI Magazine July 2008 issue titled "Brand strategy for the recession-challenged retailer." They add that "a recessionary retail strategy is about consistently reinforcing the value of the brand experience on every level, exploring new and innovative ways of articulating it and bringing a sense of discovery and excitement..."
What is your fundamental brand value? Do you offer a meaningful and differentiated point of view? Do you offer a sense of discovery and excitement? Your retail brand is the result of store premises, merchandising assortment/approach and operations [i.e., your people] all collaborating to deliver a brand and store experience that had better be unique to you, and stand for something that matters to your customers. - Are they passionate about flooring? 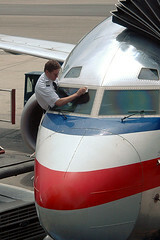 - Do they want in their hearts of heart to deliver a truly memorable customer service experience? - Are they completely committed to creating beautiful flooring solutions for customers? Barry Silverstein in "Brand Progression in a Recession" explains that "well-established brands that represent both quality and value to consumers can actually benefit from a recessionary economy." At the same time, "beyond quality and sheer market weight, brands must be ever more relevant, trustworthy and flexible. They must constantly be in tune with consumers' values, evolving needs and lifestyles..."
Which only reinforces what Tim Girvin recommends in Tim Girvin - Trends in Story, Brand and Experience Design: make sure your brand stands for something, that it has an authentic story behind it. That differentiates you, makes you highly competitive and uniquely positioned. It should not only be relevant, but also resonant, human and warm, truthful and authentic, creating layers of connection. Have you asked yourself what your brand stands for? If not, it's definitely time to do so. Engagement I originally uploaded by C.Barr. I submitted this article to Solutia Now!, our company newsletter. It was published on 8/12/08. There’s a new world order around and it’s called engagement – consumer or end-user engagement. It’s a manifestation of The Cluetrain Manifesto: The End of Business as Usual declaration that all markets are conversations. It results from increased access to broadband Internet and the many tools that enable conversation. It’s also here to stay. The new world order affects all aspects of our lives: how we bank, share photos [e.g., Flickr], prepare homework, make phone calls [e.g., Skype], network professionally [e.g. LinkedIn], research [e.g., Google], buy stuff [e.g., Amazon], and find directions [e.g., MapQuest], even how we work. It allows us to express our opinions and benefit from the experiences of others. It even allows us to engage in conversations around topics of common interest. In fact, the new world order blurs the lines between public and personal lives, between behemoth organizations and individual end users. You see, individuals prefer to engage with other individuals. The more organizations encourage employees to get involved in the conversation, the better end users react, and the more organizations can learn and contribute. It’s a wonderful and vibrant time during which an open exchange of ideas via blogs, wikis and communities leads to co-creation, new solutions and value creation. Participants engage fully! And, although the breakdown of the old rules of market interaction – think traditional push, mass-market communications – may intimidate or overwhelm, they don’t have to, particularly if you embrace the new world order. Nylon Intermediates’ Wear-Dated carpet fiber has embraced the new world order. We’re listening, participating in the conversation and creating digital content. And, then, we relate it all back to the recently redesigned Wear-Dated website. The goal: to engage end users. With Google alerts, we listen for conversations about our brand and category. We participate in social media activities like Blogger Social and BlogHer Business, contribute to The Age of Conversation, experiment with platforms like Twitter and Plurk, post photos to Flickr and have a presence on Facebook [both with a Wear-Dated carpet fiber page and a Friends of Wear-Dated group]. We create digital content. Lots of it. On Flooring The Consumer as it relates to marketing, the retail experience and marketing to women [i.e., B2B]. On The Carpetology Blog as it relates to anything carpet related [i.e., B2C]. We even have a video series, titled “A Foot’s Perspective” on YouTube, brought to you by The Women of Wear-Dated! We integrate all of those efforts on the newly redesigned Wear-Dated website which is social media friendly. The site is searchable, share-able and comment-able. Visitors can rate and comment on products and retailers. We link Carpetology [or Flooring The Consumer] content to specific web pages or to the Newsroom. Not only do we promote retailer or mill partner consumer events, but we’ve created content that helps tell the story behind the Wear-Dated brand, the people of Wear-Dated and our programs. We’ve even enabled RSS or email subscription for Newsroom items. With these steps, we begin to demonstrate that the Wear-Dated brand consists of real human beings who care passionately about the carpet category and products made with Wear-Dated carpet fiber. We also draw in mill and retail partners to help tell the carpet story. We’ve only just begun our journey, but expect the new world order to be rich, rewarding and full of engaging conversation. If you’d like to join us, look for us in the blogosphere, on Facebook, the Wear-Dated website or simply email cbwhittemore [at] gmail [dot] com. This article also inspired my related post Consumers And The New World Order at the TalkFloor Blog. Please, Change The Parking Lots! Please, give me parking lots segregated by vehicle size! Despite having been issued a Red Ford truck by Avis, I drive cars. Not SUVs or trucks or Urban Assault Vehicles. Just cars. Preferably medium to small cars [I would love to get a Mini some day...]. However, the world around me still drives SUVs and trucks. Not a surprise given the various vehicle manufacturing statistics over the past decade. I can deal with it. Really. Parking lots are possibly the most dangerous space around and the place where accidents are most likely to take place [1 in 5 accidents happen in parking lots]. So why don't parking lots owners and retailers take steps to minimize those risks? As a car driver, I try to find spots where cars get parked. That way when I pull out, I have some visibility. Inevitably, I'll get back to my car after a shopping expedition and find that towering trucks and SUVs surround me. Pulling out becomes the equivalent of running the gauntlet. I have no idea whether I will make it or not. If Amtrak can offer quiet cars where no cellphone conversations can take place, and Babies R Us can offer parking spots specifically for expectant moms, then why not create a parking lot experience that minimizes risk and inconvenience and segregates the cars from the trucks? Back to Basics originally uploaded by echerub. The basics matter, in everything we do. Yet, they often get overlooked. Or worse, don't get considered -- let alone from the perspective of the end user or customer. Especially at retail. The basics give us credibility. They are why people consider whether to do business with us or not. They are so basic that we don't have an excuse to get them wrong. And we have every reason to get them right and make sure they remain right. Take store hours. I've written about them before [see Shattering Expectations]. Wouldn't you agree that store hours are part of the basics? They tell customers when they can come in and shop us. And when they should leave. They set expectations. What they also do is communicate to customers what our attitude is about them. Our hours tell people whether we are attuned to them or not. So, if we don't open until 10am when customers wish they could shop at 8am, our hours say that we are clueless about our customer base. This is something that Warren Tyler addresses in the April 2008 issue of National Floor Trends, in an article titled "Things to Re-Evaluate When Sales Dip." He says to look at store hours. Are you open when it's convenient for your customers? That means evenings and weekends. Even holidays. He also brings up another retail basic: merchandising. He refers to Stanley Marcus' [of Neiman Marcus fame] observation that "the broader the selection and lower the price, the lower the sales. Conversely, the more concentrated the selection, the higher the price, the higher the sales." The solution: be sure to display your products as a consumer would use them in her home. Large product samples and vignettes help tell a story. They also help sell product. Too many retail stores forget that they need to tell a story with their products. That's what The Apple Store does, or Zara, or even IKEA. Within your store, don't forget to offer chairs to your customers. Paco Underhill makes a big deal about chairs. Chairs send a strong message that you care, that you welcome visitors within. If you don't have chairs, people will improvise. Or they will leave. Too many flooring stores don't offer chairs. It's a basic. Finally, your people. Do your sales associates truly love your customers? Are they fully focused on delivering a memorable experience or would they rather gather and gossip and ignore those entering into your store? Do they deliberately make life difficult for customers? Or do they suggest solutions so their customers can quickly and happily go about their business? I had an unexpected opportunity to talk Carpetology this week with Kemp Harr, publisher of Floor Focus Magazine and FloorDaily.net. I had a blast! 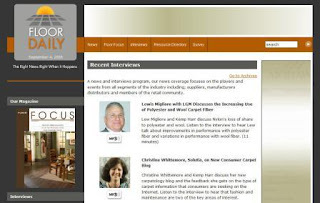 Christine Whittemore, Solutia, on New Consumer Carpet Blog -- Christine Whittemore and Kemp Harr discuss the new carpetology blog and the feedback she gets on the type of carpet information that consumers are seeking on the Internet. Listen to the interview to hear that fashion and maintenance are two of the key areas of interest. Listen at FloorDaily.net. Kemp asked me to describe The Carpetology Blog - when it was launched, what it's about, what our mission statement is, how a blog works and how it's different from other communications tools. He also wanted to know how we are connecting with readers and what kind of feedback we receive to know which topics are popular [hint: fashion ranks very high!]. How cool is this observation: We - the Women of Wear-Dated - through The Carpetology Blog provide retailers with a window on what consumers are thinking about carpet? I thought very. If you listen to the Carpetology podcast, let me know what you think. Are there other topics your customers would appreciate reading about that we should explore on The Carpetology Blog? 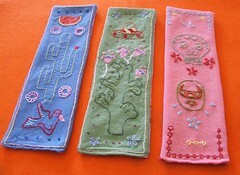 Embroidered bookmarks originally uploaded by wardi. If you are in the least bit interested in how company marketers are applying social media, then go no further than Peter Kim's post titled A List of Social Media Marketing Examples. The count on 9/3/08 included 134 different brands. As of 9/4/08, the number has increased to 162 unique brands. This is hugely exciting and inspiring, too. It means that more companies are finding ways to take part in social media to connect with their constituents. More companies are experimenting and coming up with social media marketing solutions that make sense for them. Pete started the list based on examples included in several resources. Like Jeremiah Owyang's A Chronology of Brands that Got Punk'd by Social Media, Mashable's 35+ Examples of Corporate Social Media in Action, Forrester's Groundswell Awards, 2007 and 2008, Mack Collier's Company Blog Checkup Series and the Social Brand Index - Twitter. The rest comes from feedback from readers. 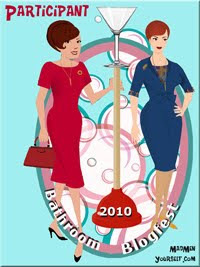 Wear-Dated's The Carpetology Blog made it to the list because of My Forrester Groundswell Awards Submission. We're also involved in Online video: YouTube channel, Photosharing: Flickr group pool, and Social networks: Friends of Wear-Dated and Wear-Dated carpet Facebook fan pages. The learning available through this post is unbelievable. I guarantee you'll be surprised at the companies listed, amazed at their social media marketing programs, and inspired to try something on your own. Go on over there. Read Pete's post. Bookmark it. And, if another company comes to mind, go ahead and leave a comment. The more complete this list becomes, the more we all benefit. let there be light... originally uploaded by darkmatter. If recession can be your best friend [see AdAge's "Recession can be a marketer's friend. From soap operas to iPods: History suggests slumps spawn innovation" by Jack Neff, 3/24/08 - reg. requ'd], what kind of creativity have you seen surface lately that relates to retail? Service is the undisputed path to profitability, success and differentiation. Good merchandising has nothing to do with commoditizing the experience, gives customers reasons to buy and showcases value. Warren Shoulberg's HFN Opinions from July 7, 2008, titled "Retails of Woe," written in reaction to Paris telling apparel retailer H&M that they were too "banal" to set up shop on the Champs Elysees, asks pointed questions of US retailers. More specifically, "Why aren't these stores blowing out new products? Why aren't they giving a cash-pressed consumer a good reason to come in and see what's new? The whole idea of fashion is to create replacement sales where none are needed, but that seems to have fallen out of fashion." He closes with "If there's one thing American retailing has proven over the years it's that good merchandising can overcome bad times. Banality, on the other hand, is just more of the same old thing." + Understand what is selling in your store. + Price products [i.e., use square foot pricing] consistently throughout your store so your consumer can more easily compare and evaluate costs. + Feature revolving credit pricing special on some products. + Showcase new ideas and trends. + Upgrade products and communicate value with the options you showcase. Understanding and adapting to your customers creates loyalty. 1. Come up with creative approaches to solve your customers' problems. 2. Before prescribing the solution, listen really carefully to what customers are asking about and describing. 3. Invite customers [satisfied and dissatisfied] to help you determine what you could do better. 4. "Deliver small heroic acts of kindness." 5. Identify your best customers, thank them, involve them, appreciate them in a public way. 6. Support your front line employees. 7. Hire sales associates who exude passion for customers. 8. Contact dissatisfied customers. Ask them about their experience. Turn the experience and them around. 9. When you interact with customer service professionals, can you exude warmth and support? 11. What ideas can you come up with to take advantage of what your community has to offer to interact with others, collaborate, reduce gas consumption or simply come up with new solutions. Shoulberg's 8/25/08 HFN Opinions, titled "Season of the Switch," reminds us that now is the time to take risks and position ourselves for a turnaround. He says "this is the best time in years.. to go after new customers." Don't cut back on advertising; run more new products; get more promotional; go after new customers. [Which echoes the 8/6/08 issue of Knowledge @ Wharton includes "A Precarious Road: How Retailers Can Navigate Inflation's Hazards" which suggests - in addition to building inventory, including future price increases in contracts, and encouraging operations and marketing departments to collaborate - increasing advertising expenditures ["Those that do not cut back [on advertising] tend to have much bigger returns for their marketing spend [in economic downturns] than during times of prosperity."] and focusing on service. Service. Merchandising. Understanding customers. Not earth shattering concepts, but certainly powerful ones in their ability to generate invaluable insights and unleash creativity at retail. Assuming you take them seriously, and get a move-on now!